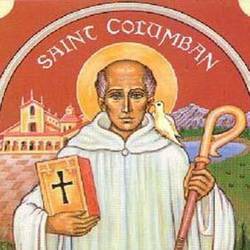 This year 2015 is the 1400th Anniversary of the death in Bobbio of St Columbanus. Born back in 543 A.D. in Leinster He became a monk after studies in Co Fermanagh. He is specially associated with Bangor Abbey as a monk and teacher. In 591 He decided to go on pilgrimage for Christ. He and 12 companions traveled throughout Europe. His greatest foundation was at Bobbio near Genoa where after a lifetime of teaching and preaching the Gospel he passed to God in 615. Please download the pdf files for more about Columbanus and to read some of his words. Check out this utube video has a very nice soundtrack with slides about the life and ministry of Columbanus and Gallus.